Welcome on MOKABAJOUR project website. 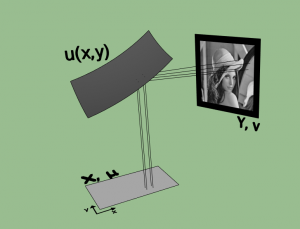 We design a software resolving the following inverse problem: define the shape of a mirror which reflects the light from a source to a defined target, distribution and support of densities being prescribed. Classical applications include the conception of solar oven, public lightning, car headlights… Mathematical modeling of this problem, related to the optimal transport theory, takes the form of a nonlinear Monge-Ampere type PDE. The high definition numerical resolution of these models remained until recently a largely open problem. MOKABAJOUR project aims to develop, using algorithms invented especially at INRIA and LJK, a reflector design software more efficient than geometrical methods used so far. The next step would be to realize and physically test prototype reflectors. Since a good picture is better than a long speech, here is a graphical representation of the problem. X and Y are two ensembles with prescribed densities and we look for u, which describes the shape of the reflector. You can find further information and download our application here.